Volkswagen Canada unveiled the all-new mid-sized Passat at the Canadian International Autoshow in Toronto. The vehicle goes on sale in late summer of this year, and features “the new look of Volkswagen,” with visual cues first seen on the Golf. 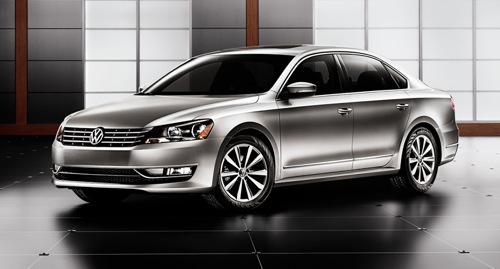 The 2011 Passat features a clean, horizontal design, the 2011 Passat combines balanced proportions with bold character. The front of the car is defined by a sculpted grille. This blends perfectly with the headlights to make a strong and distinct statement. In profile, the new Passat flows in the horizontal plane, and the coupe-like cut of the rear window meshes seamlessly with the rear of the vehicle – set off by dramatically styled taillights. Inside, the look is timeless and elegant, with premium touches throughout. A longer wheelbase translates into a noticeable increase in rear seating space. Controls are all easy to operate, and elegantly trimmed in high quality materials. The instrument panel is uncluttered, and gives the driver a clear view of all necessary information. A low lift-over assures easy access to the cavernous trunk. A range of powertrain options will be available on the new Passat. A 2.5L 5-cylinder engine is offered for the first time. Coupled with either five-speed manual, or six-speed automatic transmissions, the result is spirited performance, and excellent fuel economy. The available 3.6L V6 engine ups the ante, bringing 280 hp to the table. The automatic, six-speed, direct shift gearbox snaps off shifts smoothly and efficiently, giving the driver an added degree of sportiness. 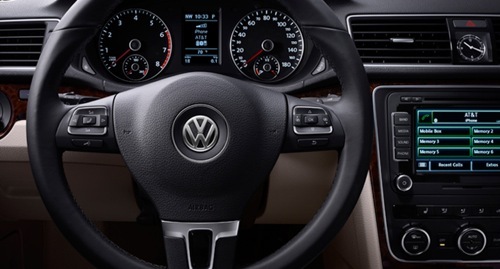 Volkswagen’s award-winning 2.0L TDI Clean Diesel engine; paired with a choice of manual or automatic six speed transmissions, provides smooth power delivery and unheard of fuel efficiency. An expected highway consumption of 4.5 l/100 km will result in tremendous range, while 140 hp and 236 lb.-ft. of torque will ensure brilliant performance. Pricing for the all new Passat will be announced this summer. South of the 49th parallel VW’s 2011 Passat will start around 20-thousand dollars. It will be competitively positioned North of the border in Canada’s mid-size sedan market.